Recently I wrote about the beginning of my faith journey. I had become dissatisfied with the prevailing secular ideologies of the day and began seriously exploring Christianity. Two years later, I was still grappling with what it all meant for my own life. It was 2010 and I had just finished law school. I was beginning my career as an attorney. Up until that point, advancing professionally had largely been the center of my life. Nearly all other aspects of my life were subservient to my professional goals. This didn’t mean that I lived a totally self-centered lifestyle. I cared about things such as social justice and volunteered regularly. However, there was an aspect of my good works that was self-serving. After all, you can’t get through higher education without being told hundreds of times that employers value “well-rounded” individuals who “give back” to the community. Further, I found that moral flexibility is often rewarded within the world of white collar professionals. This doesn’t mean that most professionals are morally bankrupt. To the contrary, I met some of the best people that I know during my time in law school and as a private practice attorney. On the other hand, a disregard for honesty and fair dealing can put a person on the fast track to wealth and privilege. In some circles, this type of conduct is acceptable or even worthy of praise. Regardless of whether a person actually takes the low road to success, the temptation is always looming. 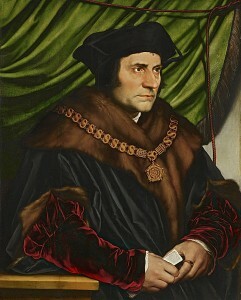 It was within this world of careerism and moral uncertainty that I first heard of St. Thomas More. His story is wonderfully portrayed in the film, A Man for All Seasons, which won the Oscar for Best Picture in 1967. More’s career took off in the early 1500’s and he enjoyed success that would make any ambitious millennial green with envy. More was both an attorney and a successful politician. He was also one of the most brilliant minds of his day and even King Henry VIII relied on him as a trusted advisor and friend. In 1529, More was named Lord Chancellor of England. More’s story was defined by his willingness to remain true to his beliefs despite the threat of losing everything. We often see similar themes on television and in movies today. There are many stories of men and women who break the rules and reject authority in order to live out their values. Yet, their actions rarely come at a significant cost and any challenges are simply stepping stone to something greater. More’s story was different. There was no going back from his disobedience. Both his career and life were on the line. It is unlikely that More could have foreseen that future generations would hold him in high regard. Even if he did, it is doubtful that it would have brought him any comfort while facing the threat of being drawn and quartered. Yet, he freely chose to forfeit his life rather than violate his conscience. I found More’s integrity appealing and something worth emulating. Yet, I wondered how one reaches a point of sacrificing everything for a higher purpose. Is it possible for a millennial to live a life of heroic virtue like More? More would be the first one to admit that his courage was received through God’s grace. Fortunately, the same Church that sustained More through his trials is with us today. It was his story that led me to explore the Catholic faith and eventually join the Church. The same temptations that I faced before my conversion still exist and always will. The difference now is that I am actively trying to put my faith at the center of my life with the help of the Church. While I do not face life or death situations, the sacraments have helped me to temper my selfish ambitions and to be more thoughtful of others. I still make plenty of bad decisions, but with God’s grace I will hopefully make fewer and fewer of them as time goes by. It is my hope that more millennials learn about the life of St. Thomas More. My generation certainly cares a great deal about living according to a set of values and not allowing outside forces to dictate how we live. We want to live with a purpose other than selfish ambition. St. Thomas More’s story demonstrates that with God’s help we can remain true to our core convictions even if the costs seem insurmountable. Andrew J. Vandiver is a lifelong Kentuckian and a convert to Catholicism. Andrew blogs at http://oldmanmillennial.blogspot.com/ and you can follow him on Facebook and Twitter. Bored With the Culture Wars?